MBA allows high speed and accurate application of Dow Insta-Stik and Dow Insta-Stik Quik-Set adhesive systems. Ideal for roofing panels. To assemble and pressurize the Multi-Bead Applicator MBA System, refer to assembly instructions on the back of the dispensing tubing label. To dispense INSTA-STIK, slowly open the ON/OFF valve handle located on the MBA handle assembly. The minimum bead size for INSTA-STIK adhesive should be between 3/4" – 1" diameter. Refer to photography for correct bead sizing. 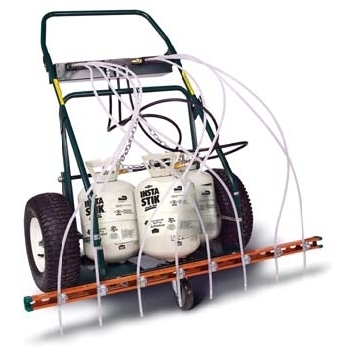 The MBA and dispensing tubing are designed to simultaneously dispense four beads of roofing adhesive. On roof decks 20' or more above grade, contact The Dow Chemical Company Roofing Technical Support Group at 1-888-868-1183 for increased application rates at the perimeter band of the roof. CAUTION -- Care must be taken when applying INSTA-STIK near roof edge. About 5 seconds before you want INSTA-STIK to stop flowing, close the ON/OFF valve by moving the valve handle to the OFF position. Continue to drag the MBA until INSTA-STIK stops flowing. It is normal for a small amount of adhesive to flow from the clear hoses after the valve is closed. Use 4' x 4' insulation boards placed end-to-end with staggered joints in alternating rows. Set boards onto the adhesive within 3 minutes of application. Walk on the insulation boards every 5-7 minutes until the insulation is firmly attached, usually 15-45 minutes. NOTE -- Humidity directly affects curing rate. Under low humidity conditions, the insulation boards must be walked on for a longer period of time. If you need to interrupt the application and return within several hours, turn the dispensing hose ON/OFF valve handle to the OFF position. Completely close the valve at the top of the cylinder. Store the MBA upright to allow excess adhesive to drain from tubing. If the MBA has been stored for a short period of time (over lunch or break), the following method may be used. Wearing your protective clothing, gloves and protective eyewear, remove hardened adhesive from tips of tubing outlets. Cut a small amount of tubing off if necessary. Turn cylinder valve on completely. Slowly turn handle of the ON/OFF valve to the ON position. Slowly open the valve handle on the MBA and flush a small amount of the adhesive through the tubing. d. INSTA-STIK is now ready to be used for another application. If the MBA has been stored overnight or in high humidity conditions, it is recommended that the dispensing tubing be replaced. If the unit has not been used for several days, the 4' dispensing hoses attaching the tanks to the MBA should also be replaced. Keep the used dispensing hose assembly attached to the MBA during storage to protect the valve from moisture contamination.